The Grand Platieres apartment block is situated right in the centre of Val Claret so shops, bars and amenities are right on your doorstep. You can easily walk to the lifts at the bottom of the Glacier for summer / Autumn skiing. There is a supermarket directly opposite and the tourist information centre is on the same street so you can make use of their baggage storage facilities on arrival and departure days. Number 32 Grand Platieres is a bright and airy studio, great for 3-4 people. There are two fold down bunk beds as you walk through the door, an ideal set-up as they can be folded away when not in use to give you more space. In the living area there is a pull out sofa bed to create 2 singles or one double bed plus a seperate single sofa bed. There is a small but modern kitchen and the clean, bright bathroom is just to the right of the bunk beds. There is a large South-West balcony with beautiful views up towards the Grand Motte and surrounding peaks. The kitchen is well equipped with a small oven/grill, two hobs with extractor fan, and fridge freezer. In the living area there is a flat screen TV which plays DVDs, and a radio. There’s an extendable dining table to seat four people. The bathroom has a full sized bath with wall-mounted shower attachment, toilet and wash basin. There is a wardrobe, cupboard unit and chest for storage. We are back from our ski trip, and would like to thank you very much for your help in booking our accomodation. We had a fantastic time, and the apartment was perfect. We loved the views of the mountain. 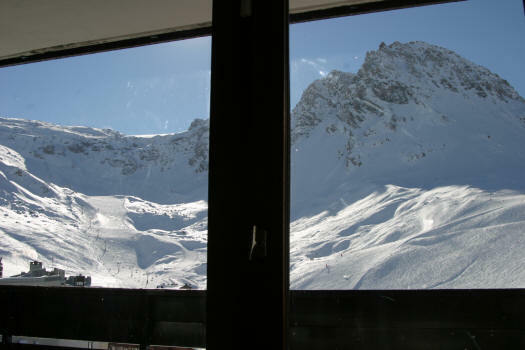 We will definately use tignes.co.uk again on our next trip.